After our yum cha experience at AKIBA, Linda and I decided to go in search for dessert. I'd heard that the shipping container village was doing a soft launch on the Canberra Day weekend and we wanted to check out the creperie, news of which kept tantalising me. When we got there, it looked as though the recreational area was ready to be used, but not all shops were open, including the creperie. The skateboard swings were pretty cool though! Miss Vân’s is proud to offer food that has been cooked by three generations of our family, spanning over four different countries. Though focusing primarily on Vietnamese cuisine, we incorporate a heavy influence of Lao & Thai cooking flavours and dishes. Food that is commonly sold by street vendors and at hawker markets in Vietnam, Laos & Thailand; we present tasty, vibrant, fresh and healthy classic dishes. A central menu consisting of phở (beef noodle soup), bánh mì (Vietnamese sandwich) & bún (Vermicelli noodle bowls), we will offer a weekly rotating “specials” menu, where one featured dish is sold in addition to the regular menu. These dishes will include items such as Vietnamese pork & lemongrass soup (Bún bò Huế), chicken congee (Cháo gà), Vietnamese chicken rice, sticky rice & grilled chicken, pad thai, springrolls & stuffed chicken wings etc. Beverages will include Vietnamese iced coffee, homemade soya bean milk infused with pandan leaf & ginger, young coconut juice, along with the standard fare of soft drinks. La Crepe is the creation of Parisien, Franck Leonhardt, whose connection with Australia commenced after a chance meeting with an Australian woman in the romantic city of Paris. It was love at first sight! They got married, lived in Paris for twelve years and relocated to Canberra in 2012 with their two sons. Franck will be recreating the delicious sweet and savory crepes from his childhood at the exciting new Westside Acton Park precinct. O‘ So Smoothie will predominantly be a smoothie kiosk which will also offer the O’ So Smoothie specialty muesli. We have developed a menu which caters to the dietary requirements of dairy-free and gluten intolerant people, being a health focused café. The menu includes a range of rich and creamy to light and refreshing smoothies. There will be everyday smoothies and a specials board which will change weekly. We will have low-carb options for those who wish to watch their sugar intake and high protein and energy shakes for those looking to power through the day. All smoothies will be made from fresh and healthy ingredients sourced and bought locally where possible. Damn Fine Roasters is a coffee roasting business with its roots and family heritage originating from Italy. It’s unique blend is Southern Italian, a family recipe which will leave you with the hypnotising aroma of this fine blend of fresh coffee. Along with selling fresh coffee, they also offer hot herbal teas, ice cold herbal teas, Italian ice cream, and a new product from Italy called Crema Caffe. What is unique and sets Damn Fine Roasters apart, is that it will be the first drive thru coffee shop in Canberra, strategically positioned at Westside Acton Park to be able to operate from dusk till dawn. This ground-breaking rooftop bar is Canberra’s first sky high saloon, the perfect place to drink in views of the city skyline while you, well, drink in! The entire structure has been designed from the ground up (literally!) with custom furniture made from recycled wooden pallets complementing the ecological feel of the garden bar. The panoramic windows provide spectacular views of Black Mountain Tower, the National Galley, Parliament House and many of Canberra’s most famous landmarks, all while you sample a bespoke menu of crisp cocktails, craft beers, side by side with both the best of local and imported beverages to suit everyone’s tastes. Located on Barrine Drive in Acton, Westside Acton Park will officially open on Saturday 14 March 2015. 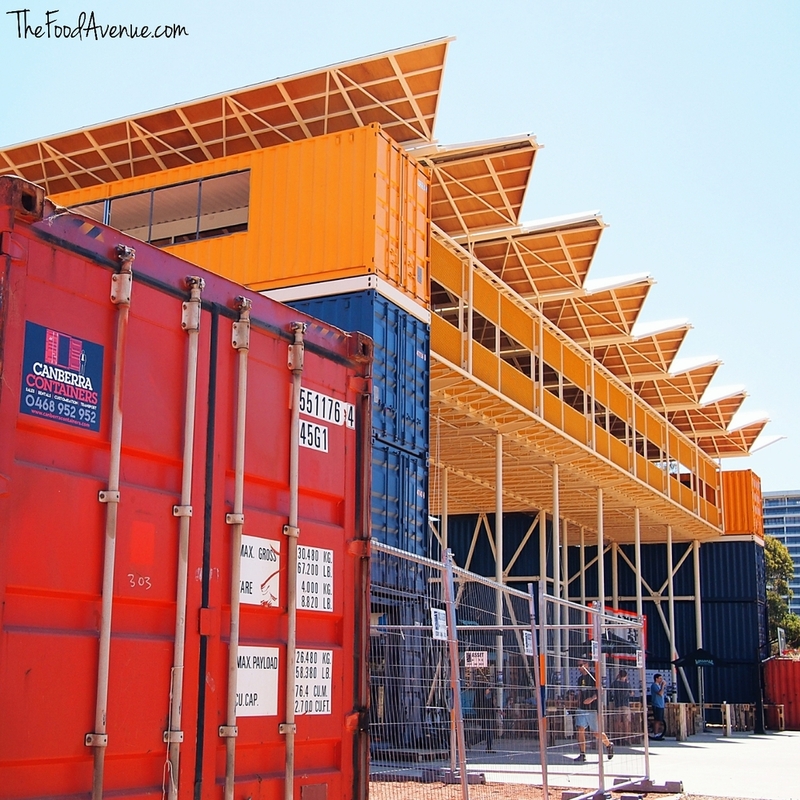 Want more information on the Canberra shipping container village? Check out the website and Facebook page.